Police aren't looking for more suspects. An Oak Bay officer leaves the apartment building where the bodies of sisters aged four and six were found by police on Boxing Day in the community of Oak Bay in Victoria, B.C., on Wednesday. A family member and a friend have identified the girls as Aubrey Berry, 4, and her sister Chloe Berry, 6. 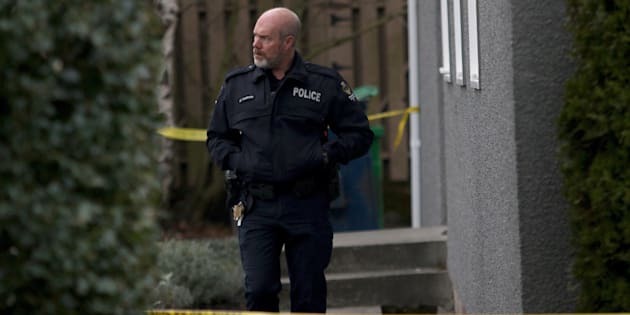 Police have said officers were called to a home in Oak Bay on Monday evening where the bodies of two children were discovered. Trisha Lees, a friend and spokeswoman for the family, said the girls were delightful. "They were just full of energy, full of smiles, full of giggles and very silly. Like most little girls their age, they liked to have lots of fun," she said. Trisha Lees speaks to media from Willow's Beach in Victoria, B.C., on Wednesday. Chloe's Grade 1 school photo taken this fall depicts a grinning blonde girl dressed in a uniform and missing a front tooth. A photo of Aubrey shows a smiling, blue-eyed girl with long, blonde hair, wearing a blue and green blouse. Lees said Aubrey was in pre-school and had recently started coming into her own, transitioning from a toddler into a child. "She was silly. She was lots of fun. She was always laughing, she had a huge smile," she said. The children would often visit a beach near their home with their mother, Sarah Cotton, and the family loved visiting a nearby Gulf Island, Lees said. She said Sarah was devoted to the girls. "Seeing the three of them together was an absolute delight. Sarah was just one of those mothers who was born to be a mother and did an exceptionally great job with them in every possible way." Lees said she has been with Cotton since the tragedy. Flowers rest near the home where the bodies of sisters Chloe and Aubrey Berry were found by police on Boxing Day in the community of Oak Bay on Wednesday. Cotton shared custody with her former common-law husband, Andrew Berry, Lees said. The pair had been estranged since 2013, she said. Frank Cotton, the girls' great-uncle, said his daughter had been teaching Chloe to ride horses. "(Chloe) was doing very well. She was catching on to riding properly. And it's all over," he said, his voice choked with emotion. Lees said Cotton called police on Christmas Day after their father didn't return the girls as scheduled. The Vancouver Island Integrated Major Crime Unit said on Wednesday that the man remains in hospital and is not in police custody. The specialized team said earlier that it was called in to assist the Oak Bay Police Department with a double homicide. A police car is parked outside an apartment building where the bodies of Chloe and Aubrey Berry were found by police on Wednesday. Officers from a number of other detachments, including RCMP, and the Victoria, Saanich and Central Saanich police departments are assisting with the investigation. The tragedy has touched many people in the community and beyond, including first responders, Oak Bay Deputy Chief Ray Bernoties said in a statement. He added that the officers are being "very well cared for." Oak Bay Mayor Nils Jensen issued a statement Wednesday evening saying the community has been shaken by the loss of the two girls. Jensen said a candle-light vigil will be held at nearby Willows Beach, B.C., on Saturday. Police have said they are not looking for additional suspects. They have not released any further information about the investigation. Deborah Marshall, a spokeswoman for BC Ferries, confirmed information first reported by the Victoria Times Colonist that Cotton and Berry met while working for the corporation. She said Cotton left BC Ferries about five years ago, while Berry left in the spring.